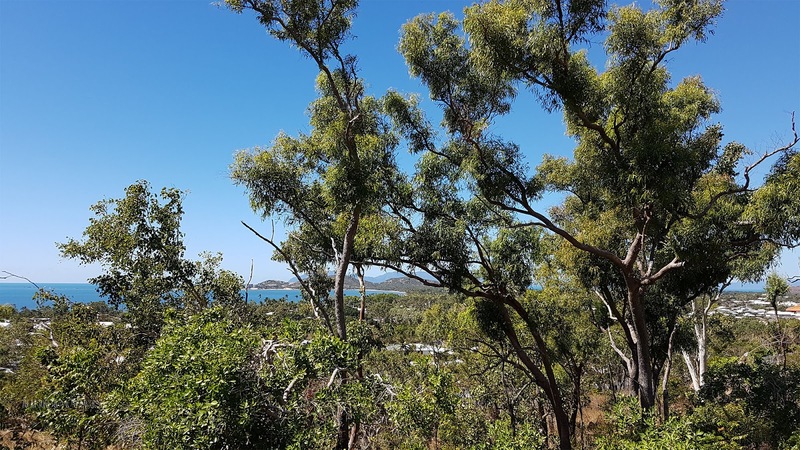 thoughts & happenings: To Bowen, Queensland. In Winter 2017 we headed to Bowen a long way from home. The winter weather was warmer than usual so we decided to stay for a few weeks and not go further north because we had come far enough north for warm weather having been to Townsville the year before. Bowen is known for the wind but we didn't encounter much at all. Most women were wearing shorts and some wore sundresses/frocks the men wore shorts and of course there are our 'thongs', those things you wear on your feet! Tomatoes growing in the tropics in winter 2017. We went up on the lookout only to discover one couldn't see that much for the trees, however, we did see another caravan park that looked good not far from a beach so we headed down and booked for a week there. I didn't realise that Bowen had a 'Big Mango'. Very windy here today. And yesterday. Not a fan. The photo is of a Mango taken on the way to Bowen and there is another in Bowen down by the sea at the information centre which is smaller. Yes that's it, they are lovely in a fruit salad if you like fruit salad. Mango Ice cream, mango cakes and so on.. Yes, for our international readers we always have define our version of thongs. Wow!! 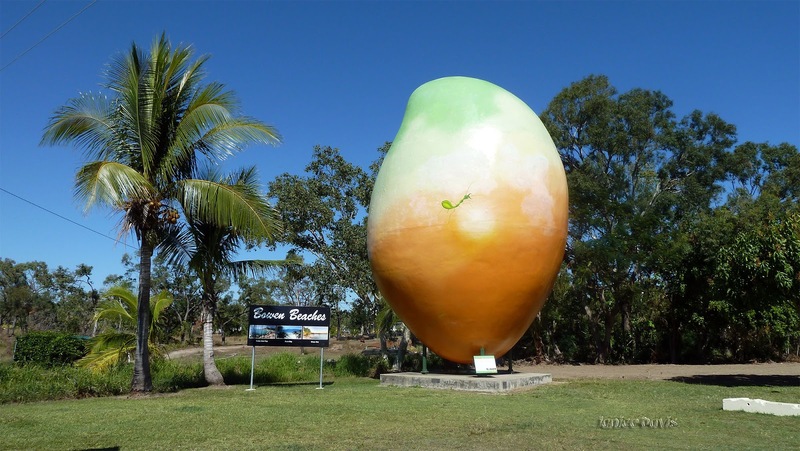 is the big mango some kind of symbol of Bowen?.. Lovely pictures.. Yes it's a Mango growing area it seems along with strawberries and tomatoes in winter. Beautiful large Mango, are they big out there, lol. Looks like a good place to stop for a few weeks. I expect they use a GPS to have the rows so straight, but they grow all in unison as well, it's amazing. That is a long way from Tasmania! It is David and very long way especially when driving from Tasmania. It's good to see the country as you travel in the vehicle where as in a plane you don't get to see that much. I like your winters no cold, no snow. Not up that way Andy, but further down south and where I live we get snow on the mountains but it doesn't seem to stay for long just a few days. Nice pictures. Special to see that wondrful work of art. Oh I'd love some warm tropical weather instead of the snow we have coming! You keep warm with your snow that's coming. Que bueno!...disfrutar de esas templadas temperaturas, en pleno invierno...aquí el frío ha hecho que la mayor parte de la población, hayamos cogido algún catarro, del que yo tampoco me he podido librar. Northern Australia is lucky in my opinion to have warmer winters than where I live in southern Australia so it's good to get to the warmth if you like it for winter, sometimes we can't though. Cold are not so good in winter or anytime of the year. I could do with some warm sun today---- Not sure about a giant mango, though. As always, thanks for sharing. The mango might taste lovely as they are in season here in Australia. It's cold here in Virginia. You keep warm John, and I expect you and your family are using that lovely new room. It's never ending the places to visit and see, even though we have been many times to several places in Australia there is always something new to see. are quite low for a change. They are selling like "hot cakes" - a real bonanza for the shop owners. I love mango cheese cakes and ice cream. I hope you were able to get up to the Bowen Falls. If I recall correctly the views are stunning. Colin, have seen photos of the falls but that's about it. We can't walk that distance anymore! That's life. Mangoes down here have been plentiful and cheaper than usual this summer. I'm glad someone recognized the mango because I was wondering what it was! Oh gosh, you don't have Mango's over your way? Can't say I've ever seen a mango quite that large! loved the tomato fields ,reminded me the native village tomato fields owned by grandparents . this huge mango is great ,my family love mango this is grown in abundance here in surroundings and are very popular in whole country . i wonder if the winter make people wear shorts what about summer then? Many people in winter wear shorts, they wear them all the year around. In our cooler climate in the winter they wear long trousers. A long way to go to get warm. I had a friend in Bowen for a few years but I have never been there. The caravan park on the beach sounds good. Tis a very long way to go to be warm enough - pity we feel we have to go so far.